In my series Of the Wild I seek to capture the exquisite details of my subject’s features, in this case the eye, beak and feathers. 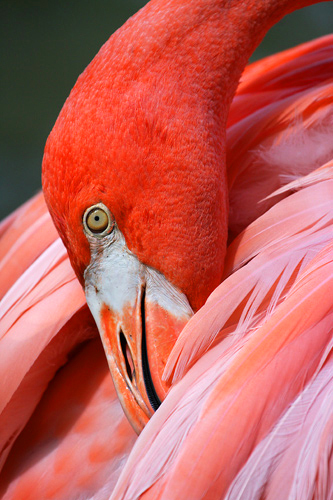 When Flamingos rest, their body functions slow, making it harder for them to stay warm. As with many other birds, they stand on one foot and tuck their beaks into the feathers on their backs. Because the featherless parts of their body, such as their beaks and legs, get cold the fastest, the birds tuck them into their warm feathers as if into a blanket to conserve heat. As they sleep, they wake up briefly to switch legs several times. The beak of a Flamingo has an unusual shape because they live in shallow lagoons and lakes and feed on small organisms in the water. They bend their heads down, dipping the beak into the water and creating a scoop, sweeping it from side to side through the water to collect tiny mollusks, brine-shrimp, crustaceans and single-celled algae. As the tongue pumps water through the beak, this food is caught on a sieve-like structure inside and is passed down the throat. These foods contain Carotenoids which are a family of natural pigments that give the birds their pink color. Now you know all about Flamingos and why they are so often seen…tucked.